Reverdy Johnson (May 21, 1796 – February 10, 1876) was a statesman and jurist from Maryland. He gained fame as a defense attorney, defending notables such as Sanford of the Dred Scott case, Maj. Gen. Fitz John Porter at his court-martial, and Mary Surratt, alleged conspirator in the assassination of Abraham Lincoln. A former Whig, he was a strong supporter of the Union war effort. At first he opposed wartime efforts to abolish slavery until 1864, and in 1865 supported the 13th Amendment banning slavery. Reverdy Johnson's house in Annapolis, Maryland. Johnson was born on May 21, 1796 in Annapolis, Maryland. He was the son of a distinguished Maryland lawyer and politician, John Johnson (1770–1824), who served as Attorney General of Maryland from 1806 to 1811 and later Chancellor of Maryland, and Deborah (née Ghieselen) Johnson (1773–1847). His younger brothers were John Johnson Jr. (1798–1856), the last Chancellor of Maryland, and George Johnson (1817–1892). He graduated from St. John's College in 1812 and then studied law. He was admitted to the bar in 1815. In 1817, Johnson moved to Baltimore, where he became a legal colleague of Luther Martin, William Pinkney and Roger B. Taney, the Attorney General and later Chief Justice of the United States from 1835 until 1864. He was appointed chief commissioner of insolvent debtors of Maryland in 1817. From 1821 until 1825 he served in the Maryland State Senate and then returned to practice law for two decades. Johnson, along with Judge John Glenn and Evan Ellicott were responsible for exacerbating the Baltimore bank crisis of 1835. Mobs of angry depositors attacked and damaged his home facing Battle Monument Square on the northwest corner of North Calvert and East Fayette Streets, just south of the Baltimore City Courthouse (site of the future enlarged Third Courthouse of 1899–1900). His home was previously the site of the first brick house built in Baltimore Town for Edward Fortrell, in 1741, and later replaced by the mansion/townhouse built for James Buchanan in 1799, sold to Johnson. Following the collapse of the Union Bank of Maryland, Johnson obstructed efforts to obtain a fair and objective accounting of the bank's assets in order to maintain his personal fortune. He falsely accused Evan Poultney and Thomas Ellicott of misconduct in order to create a smokescreen intending to obscure his own misconduct. From 1845 to 1849, Johnson represented Maryland in the United States Senate as a Whig. From his confirmation by the Senate in March 1849 until July 1850, Johnson was Attorney General of the United States under President Zachary Taylor. He resigned[clarification needed] that position soon after Millard Fillmore took office. While U.S. Attorney General, he was allowed to help Virginians Charles W. Russell and Alexander H.H. Stuart defend the Wheeling Suspension Bridge in his private capacity, that bridge also connecting two sections of the National Road as the first bridge crossing a major river west of the Appalachian Mountains. Although the plaintiffs technically won twice based on their argument that the bridge obstructed a navigable river, the bridge was never demolished (only repaired after wind damage) and further bridges were then constructed, including one over the Mississippi River at Rock Island in 1856. (which also led to litigation). In November 1856, a large crowd, armed with guns and clubs, burned an effigy of Johnson on the railing of the Battle Monument in front of his house to protest a speech he made in New York against President Fillmore. A conservative Democrat, Johnson supported Stephen A. Douglas in the presidential election of 1860. He represented the slave-owning defendant in the controversial 1857 case Dred Scott v. Sandford. However, Johnson was personally opposed to slavery and became a key figure in the effort to keep Maryland from seceding from the Union during the American Civil War. He served as a Maryland delegate to the Peace Convention of 1861 and from 1861 to 1862 served in the Maryland House of Delegates. During this time he represented Maj. Gen. Fitz John Porter at his court-martial, arguing that Porter's distinguished record of service ought to put him beyond question. The officers on the court-martial, all handpicked by Secretary of War Edwin Stanton, voted to convict Porter of cowardice and disobedience. 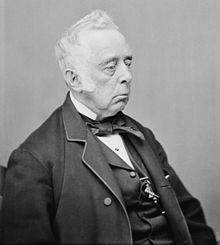 After the capture of New Orleans, President Abraham Lincoln commissioned Johnson to revise the decisions of the military commandant, General Benjamin F. Butler, in regard to foreign governments, and reversed all those decisions to the entire satisfaction of the administration. After the war, reflecting the diverse points of view held by his fellow statesmen, Johnson argued for a gentler Reconstruction effort than that advocated by the Radical Republicans. In 1863, he again took a seat in the United States Senate, serving through 1868. "The antislavery amendment caught Johnson's eye, however, because it offered an indisputable constitutional solution to the problem of slavery." In 1864, in a speech on the Senate floor, Johnson "cut loose from all Pro-Slavery associations by a bold declaration of strongest Anti Slavery sentiments," speaking in favor of the immediate and universal emancipation, and advocated the proposed amendment to the Constitution forever prohibiting slavery in the United States. In 1865, he defended Mary Surratt before a military tribunal. Surratt was convicted and executed for plotting and aiding Lincoln's assassination. In 1866, he was a delegate to the National Union Convention which attempted to build support for President Johnson. Senator Johnson's report on the proceedings of the convention was entered into the record of President Johnson's impeachment trial. In the Senate, he also served on the Joint Committee on Reconstruction which drafted the Fourteenth Amendment to the United States Constitution, but he voted against passage of the amendment. In 1866, he addressed the Senate regarding the appointment of provisional governors in the Southern States. In 1867, Johnson voted for the Reconstruction Act of 1867, the only Democrat to vote for a Reconstruction measure in 1866 or 1867. On June 12, 1868, he was appointed minister to the United Kingdom, beginning his term on September 14, 1868. While in England, he was criticized for fraternizing with the Lairds, Wharncliffes, Roebucks, and Gregorios, of England, which was considered a blunder in diplomacy. Soon after his arrival in England negotiated the Johnson-Clarendon Treaty for the settlement of disputes arising out of the Civil War, including the Alabama Claims. The Senate, however, refused to advise and consent to ratification, and he returned home on the accession of General Ulysses S. Grant to the presidency. Again resuming his legal practice, he defended Ku Klux Klan members against indictments brought under the Ku Klux Klan Act of 1871. Even though out of office, Johnson continued to offer his opinion on public matters. In December 1874, he wrote to The New York Times, stating that he hoped that after the next Presidential Election, "the General Government will thereafter be brought back into the part of the Constitution, that the limits of its powers will be maintained, that the reserved authority of the States will be recognized, and that the rights of its citizens will be faithfully preserved." In December 1875, he wrote a letter to the Baltimore Sun discussing the potential impact of England's purchase of a controlling interest in the Suez Canal. In early 1876, Johnson was in Annapolis arguing the case of Baker v. Frick in the Court of Appeals and was a guest at the Maryland Governor's Mansion. On February 10, during a dinner party at the mansion, he fell near a basement door, possibly after tripping, and was killed instantly after hitting his head on a sharp corner of the mansion's granite base course and then again on the cobblestone pavement. Louis E Johnson (1837–1905), who married Marie May Bostick (1856–1942). He was the United States Marshal of South Carolina. After his death on February 10, 1876, Johnson was buried at the Greenmount Cemetery in East Baltimore. Johnson had been the last surviving member of the Taylor Cabinet. In the 2011 film The Conspirator, Johnson is portrayed by actor Tom Wilkinson. ^ a b c d e Holt, Michael. "Reverdy Johnson (1849–1850): Attorney General". American President: An Online Reference Resource. The University of Virginia. Archived from the original on 17 December 2010. Retrieved 13 December 2010. ^ "John Johnson (Johnson, John, 1798-1856, reporter)". onlinebooks.library.upenn.edu. University of Pennsylvania. Retrieved 11 May 2017. ^ Gill, Richard W.; Johnson, John (1 September 1833). "Reports of cases argued and determined in the Court of Appeals of Maryland: [1829-1842] ..." catalog.hathitrust.org. F. Lucas, Jr. Retrieved 11 May 2017. ^ William J. Marbury, "The High Court of Chancery and the Chancellors of Maryland", Report of the Tenth Annual Meeting of the Maryland State Bar Association, (1905), p. 137-155. ^ a b c "JOHNSON, Reverdy - Biographical Information". bioguide.congress.gov. Biographical Directory of the United States Congress. Retrieved 11 May 2017. ^ Shalhope, Robert (2009). The Baltimore Bank Riot. Urbana: University of Illinois Press. ISBN 978-0-252-03480-0. ^ "Hon. Reverdy Johnson Burnt in Effigy in Baltimore". The New York Times. 12 November 1856. Retrieved 11 May 2017. ^ Misspelled in Scott v. Sandford, 60 U.S. 393 (1857). ^ a b "Visitors from Congress: Reverdy Johnson (1796-1876) - Mr. Lincoln's White House". mrlincolnswhitehouse.org. The Lehrman Institute. Retrieved 11 May 2017. ^ Vorenberg, Michael (2001), Final Freedom: The Civil War, the Abolition of Slavery, and the Thirteenth Amendment, New York: Cambridge, p. 74, ISBN 9781139428002 . ^ Times, Special Dispatches To The New (6 April 1864). "FROM WASHINGTON. ; The Anti-Slavery Amendment to the Constitution. Eloquent Speech of Reverdy Johnson. He Takes Strong Ground for Immediate Emancipation. The National Bank Act Under Consideration. The Banks to be Subject to State and Municipal Taxation". The New York Times. Retrieved 11 May 2017. ^ "THIRTY - NINTH CONGRESS. ; FIRST SESSION. SENATE. HOUSE OF REPRESENTATIVES". The New York Times. 12 January 1866. Retrieved 11 May 2017. ^ "WASHINGTON NEWS. ; Discussion Upon the Veto Continued. An Elaborate Speech by Reverdy Johnson. Remarkable Episode by Senator Wade. He Tries to Press the Matter to a Vote. After a Sharp Rebuke the Senate Adjourns. The Dodge-Brooks Case in the House. Mr. Brooks Makes a Curious Speech. Pay and Bounties to Officers and Soldiers. THIRTY-NINTH CONGRESS. FIRST SESSION. SENATE. HOUSE OF REPRESENTATIVES". The New York Times. 6 April 1866. Retrieved 11 May 2017. ^ "Reverdy Johnson on Reconstruction". The New York Times. 7 October 1867. Retrieved 11 May 2017. ^ "The Maryland Senatorship--Letter from Hon. Reverdy Johnson. ; Hon. REVERDY JOHNSON, of Maryland, has written the following letter to Hon. JOHN LEB CARROLL, a member of the present State Senate:". The New York Times. 9 January 1868. Retrieved 11 May 2017. ^ "Our New Minister to England--The Appointment of Reverdy Johnson". The New York Times. 13 June 1868. Retrieved 11 May 2017. ^ "Reverdy Johnson (1796–1876)". history.state.gov. Office of the Historian, Bureau of Public Affairs United States Department of State. Retrieved 11 May 2017. ^ "Revendy Johnson in England". The New York Times. 12 January 1869. Retrieved 11 May 2017. ^ "Mr. Punch and Mr. Johnson". The New York Times. 3 May 1869. Retrieved 11 May 2017. ^ "Mr. Reverdy Johnson's Return". The New York Times. 22 May 1869. Retrieved 11 May 2017. ^ Times, Special Dispatch To The New-york (7 June 1869). "REVERDY JOHNSON AT HOME. ; A Conversation with the ExMinister to England. His Views on the Rejection of the Alabama-Claims Treaty. Effect of Mr. Sumner's Speeoh on the English Ministry and People". The New York Times. Retrieved 11 May 2017. ^ "Greeley Says There is No Kuklux in the South Testimony of Reverdy Johnson, a Good Democrat, on the Subject". The New York Times. 20 July 1872. Retrieved 11 May 2017. ^ "THE KUKLUX. ; Reverdy Johnson's Argument on the Constitutionality of the Enforcement Act". The New York Times. 17 April 1872. Retrieved 11 May 2017. ^ "REVERDY JOHNSON ON ANDREW JOHNSON". The New York Times. 21 September 1875. Retrieved 11 May 2017. ^ "LETTERS FROM PROMINENT DEMOCRATS. ; GEORGE TICKNOR CURTIS. REVERDY JOHNSON". The New York Times. 30 December 1874. Retrieved 11 May 2017. ^ "REVERDY JOHNSON ON ENGLAND'S PURCHASE". The New York Times. 18 December 1875. Retrieved 11 May 2017. ^ "REVERDY JOHNSON'S DEATH. ; AFTER DINING WITH THE GOVERNOR OF MARYLAND HE LEAVES THE HOUSE AID IS FOUND LIFELESS IN THE YARD". The New York Times. 11 February 1876. Retrieved 11 May 2017. ^ "Hon. Reverdy Johnson. ; A Physician's Theory of the Cause of Death--Marks of Respect to the Deceased Statesman". The New York Times. February 11, 1876. Retrieved September 5, 2011. ^ a b "Death at Mrs. Reverdy Johnson". The New York Times. 20 March 1873. Retrieved 11 May 2017. ^ a b c d "THE LATE REVERDY JOHNSON". The New York Times. 13 February 1876. Retrieved 11 May 2017. ^ Times, Special To The New York (16 July 1907). "Reverdy Johnson". The New York Times. Retrieved 11 May 2017. ^ "Mr. Reverdy Johnson". The New York Times. 11 February 1876. Retrieved 11 May 2017. ^ "Reverdy Johnson (1796-1876)". www.thelatinlibrary.com. THE LATIN LIBRARY. Retrieved 11 May 2017. ^ "THE LATE REVERDY JOHNSON. ; HIS FUNERAL IN BALTIMORE YESTERDAY-- MANY FRIENDS OF THE DECEASED PRESENT". The New York Times. 14 February 1876. Retrieved 11 May 2017. This article incorporates text from a publication now in the public domain: Chisholm, Hugh, ed. (1911). "Johnson, Reverdy" . Encyclopædia Britannica (11th ed.). Cambridge University Press. United States Congress. "Reverdy Johnson (id: J000169)". Biographical Directory of the United States Congress. . Includes Guide to Research Collections where his papers are located. This page was last edited on 27 March 2019, at 16:14 (UTC).